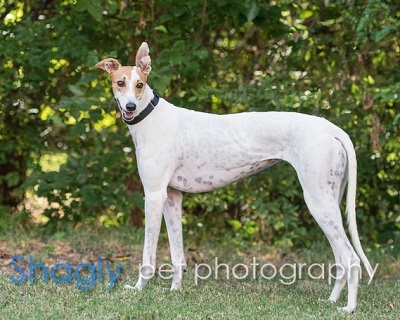 Jenny, aka Min Min, is a 1½-year-old white and fawn female born November 24, 2013. Her sire is Yahoo Omar, and her dam is Token Lady A. Jenny's racing days ended with her 12th race on July 16, 2015 when she sustained a career ending injury. She is being medically evaluated by Dr. Christy Soileau and Dr. Aaron Wages at VCA Preston Park Animal Hospital. Jenny has not yet been tested with cats or other small animals. Jenny's x-rays were sent and evaluated by Dr. Robert Barstad of Dallas Veterinary Surgery Center. A CT exam shows Jenny's fracture is to her sinus area where there appears to be a good blood supply with no indication of trauma to her nasal passages. Dr. Barstad feels that Jenny will heal with very restricted activity over the next 8-10 weeks. X-rays will be taken around October 1st unless she develops complications. Jenny's scheduled medical procedures were performed on October 8, but due to complications, only her dental was achieved. She is being reevaluated for the completion of her spay at this time. Jenny has safely completed her medical procedures. 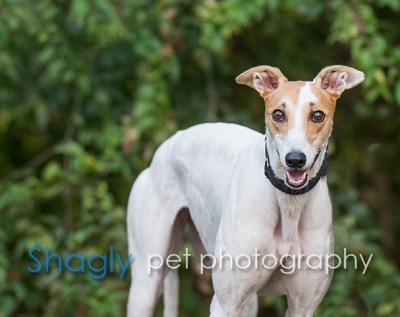 This pretty girl is ready to find a home!